Did you ever notice that life often doesn’t go as planned? When I first envisioned a financial goals system I had an idea of what the first topic would be but after asking you what your money goals were for 2012, it wasn’t at the top of the list. 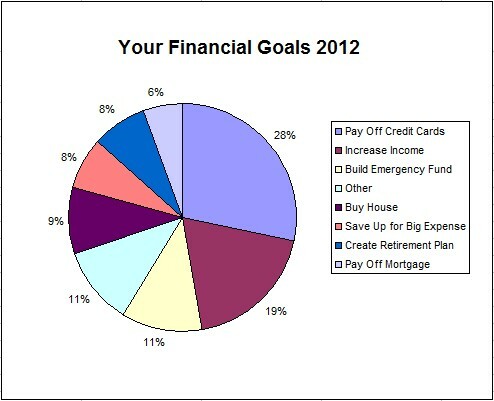 Here are your financial goals for the coming year. Most of the goals are pretty self explanatory except for “Other”. I grouped all the goals that only had a few votes into the “Other” category for the purpose of the summary. Of course, that doesn’t mean they’re not as important as the goals that got thier own slices in the pie chart, just that more people shared the other goals. As a reminder, here’s a snapshot of all the goals that you had to choose from. Some people did write in their own goals, which was awesome, because obviously not everyone has the same money objectives in 2012. I liked reading those because it gave me some insight into what other money topics you have on your mind. Thanks to everyone who shared their financial goals! About 27% of everyone who looked at the survey answered it, so if you don’t see your goal sufficiently represented here, make sure to leave your vote next time. I think one reason not as many people wanted to vote for their major financial goal was that I required you to include your email address when voting. That’s kind of what I expected, and in a way was hoping for. I think it’s easy to check a box and click Submit for a goal but I think leaving your email address was more of a comittment towards that goal. I want to work with people who are serious about hitting their goal and I think we have a good core group of people who responded who are ready to take some action. 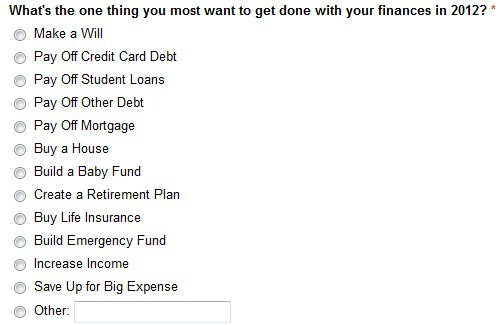 Based on the results above, the first financial goal project will be on paying off credit card debt! For those of you who responded, be on the lookout for an email from me in the next few days about how to get started. If you didn’t get in on this round of the project, you can sign up below for my email newsletter for future updates. Having financial goals is very important. I think your post highlights this very well. I would say one of the most important goals for anyone with credit card and store debt is to pay these off as fast as possible. This is very expensive debt and cost you a lot in interest. Interesting data Ben. I’d be interested to know how many people can reach their goals in paying off their credit cards this year, or paying them down substantially.